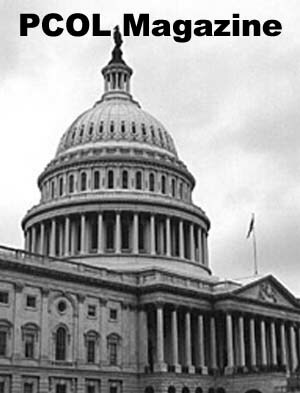 Read and comment on these two excerpts from the Consolidated Appropriations Bill that the House of Representatives is expected to vote on next week in Congress. The bill contains the Peace Corps Appropriation of $325 M for FY 2004 - a 9% increase over 2003. On November 19, PCOL reported that the Foreign Operations Appropriations Bill had gone to conference and that the joint Senate-House Conference Committee had agreed to fund Peace Corps at the higher level. The original House version of the bill had included an appropriation $314 million for the Peace Corps, $45 million below President Bush's request of $359 million for FY 2004. Instead of voting on each appropriations bill separately, the Republican leadership in Congress has decided to consolidate seven separate appropriations bills in an Omnibus package that includes the Foreign Operations Appropriations Bill that contains the Peace Corps appropriation. The Foreign Operations Appropriations Bill is one of only two of the seven bills that have been approved in conference. This increases the likelihood substantially that no changes will be made in the Foreign Operations Appropriations portion of the bill on the floor of the Senate or House. Although the House is expected to approve the bill next week, Senate Majority Leader Bill Frist told the White House that he does not plan to call the Senate back into special session to approve the bill, so final approval by the Senate will have to wait until the Senate returns from recess on January 20. Minority Leader Thomas A. Daschle (D-S.D.) has said he will seek unanimous consent Tuesday for immediate passage of the foreign operations section of the bill, which includes increased funding for the international effort to combat AIDS. For necessary expenses to carry out the provisions of the Peace Corps Act (75 Stat. 612), $310,000,000, including the purchase of not to exceed five passenger motor vehicles for administrative purposes for use outside of the United States: Provided, That none of the funds appropriated under this heading shall be used to pay for abortions: Provided further, That funds appropriated under this heading shall remain available until September 30, 2005: Provided further, That during fiscal year 2004 and any subsequent fiscal year, the Director of the Peace Corps may make appointments or assignments, or extend current appointments or assignments, to permit United States citizens to serve for periods in excess of five years in the case of individuals whose appointment or assignment, such as regional safety security officers and employees within the Office of the Inspector General, involves the safety of Peace Corps volunteers: Provided further, That the Director of the Peace Corps may make such appointments or assignments notwithstanding the provisions of section 7 of the Peace Corps Act limiting the length of an appointment or assignment, the circumstances under which such an appointment or assignment may exceed 5 years, and the percentage of appointments or assignments that can be made in excess of 5 years. For necessary expenses to carry out the provisions of the Foreign Assistance Act of 1961 for the prevention, treatment, and control of, and research on, HIV/AIDS, $491,000,000, to remain available until expended: Provided, That of the funds appropriated under this heading, $15,000,000 may be apportioned directly to the Peace Corps to remain available until expended for necessary expenses to carry out activities to combat HIV/AIDS, tuberculosis and malaria: Provided further, That of the funds appropriated under this heading, not more than $8,000,000 may be made available for administrative expenses of the office of the `Coordinator of United States Government Activities to Combat HIV/AIDS Globally' of the Department of State: Provided further, That in carrying out the duties specified in section 1(f)(2)(B)(ii)(VII) of the State Department Basic Authorities Act of 1956, the Coordinator shall ensure that assistance is provided for activities in not fewer than 15 countries, at least one of which shall not be in Africa or the Caribbean region: Provided further, That of the funds appropriated under this heading, up to $75,000,000 should be made available for the safe and appropriate use of injections and other forms of infection control and prevention, and for blood safety programs. Despite a personal plea from President Bush for swift action, Senate Majority Leader Bill Frist (R-Tenn.) indicated yesterday that he is reluctant to call senators back to Washington this month to finish work on spending bills for the rest of this fiscal year. Bush called Frist on Thursday to urge him to bring the Senate back for a vote on the bill the week before Christmas, according to Eric Ueland, Frist's deputy chief of staff. But Frist is "not inclined to call members back for a roll-call vote in light of the commitment he gave colleagues" before they recessed for Thanksgiving that they would not have to return for votes before the new session begins in January, Ueland told reporters. Frist did not rule out a change of heart, however. He will consult with colleagues about the president's request, Ueland said, and if there is any change in plans, he will announce it Tuesday. The House plans to return Monday to consider the $328 billion catchall spending measure, which combines seven appropriations bills that Congress was unable to approve separately before it left town for the holidays. Although the Senate will reconvene officially Tuesday to take up the bill, action could be blocked by an objection from a single senator. Sen. Robert C. Byrd (W.Va.), ranking Democrat on the Appropriations Committee, has said he intends to object. Byrd has complained, in particular, about Frist's plan to pass the measure without a roll-call vote. He said the bill, which would finance most domestic agencies of the federal government through the end of the fiscal year, Sept. 30, is too important to pass without debate or on-the-record votes. Republicans were under pressure to complete action on the measure this year to demonstrate their fiscal prowess, especially after criticizing Democrats for slow action on spending bills when they controlled the Senate last year. But there is also concern that the bill, if brought up now, could be defeated unless there is a full turnout of senators, who could be difficult to round up as Christmas draws near. Also, many lawmakers are still seething over provisions dealing with overtime pay, media ownership and other issues that were significantly altered at the last minute under pressure from the White House. In addition, several conservative groups have complained about spending on "pork-barrel" projects. Without Senate action this year, passage of the "omnibus" spending bill would probably be delayed until after Congress reconvenes Jan. 20 to hear the president's State of the Union speech. In the meantime, agencies covered by the bill would continue to be funded at current levels. Meanwhile, Minority Leader Thomas A. Daschle (D-S.D.) said he will seek unanimous consent Tuesday for immediate passage of the foreign operations section of the bill, which includes increased funding for the international effort to combat AIDS. He called on Bush, who supports the new funding, to urge Senate GOP leaders to go along with the proposal. "This crisis is too pressing to allow the funding to be held captive any longer by the special-interest giveaways loaded into the omnibus appropriations bill," Daschle said. Leave your comments on the series below. Read comments by RPCVs here, here and here. I am running an Peace Building NGO in India after my MSW and looking for funding and techical resourceful partners. Since this site is good and informative I took this opportunity to seek others help to work in India.